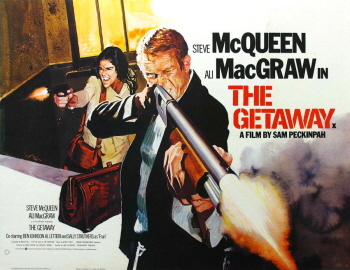 In The Getaway director Sam Peckinpah has crafted one of the tightest, cleanest, most physically compelling films to tweak your fancy in a long while. Harrumph, you say? Go soak your head in Kael, I say. Better yet, truck on out to one of the nabes and see the movie. It continues to rank among the top money-grossers of the year and will undoubtedly crop up here and there for some time to come. From the opening frames of semi-wild beasties startled into postures of alarm by an unseen presence; from our slowly dawning realization that the animals’ tranquil sanctuary functions as precisely the opposite for other creatures caged within its walls; from the moment when throbbing, insidiously penetrating mill noises supersede the dulling monotony of prison life and inject the as-yet-unidentified situation with a crescendoing tension, The Getaway gathers its energy, begins to move, and lunges headlong away from the stasis of a centerpoint, racing toward some spot on the outer circumference of life. Peckinpah navigates the entire course with a winner’s reckless confidence and consummate control. Most Peckinpah film buffs have their favorite scenes; my personal list runs to just over four hundred examples. But whenever I try to explain my fascination with his technique, why I find it so refreshing and exhilarating and spellbinding, why it’s so gratifying to see an incisive mind using cinematic conventions with a sense of humor and irony, I always flash on a shot from The Wild Bunch. It’s not an overtly outrageous shot by itself. No spectacular bloodletting. It’s not even particularly noteworthy scenically. It’s the kind of shot I suspect fades from memory about two seconds or less after it’s off the screen. But it strikes me as representative of Peckinpah’s technical virtuosity—a gift pooh-poohed by some insensitive soul in the pages of The Village Voice who derisively categorized Peckinpah as “the most academic manipulator of Russian montage in America since Lewis Milestone.” Lewis Milestone he definitely ain’t.